Tell us about your company’s safety success or an inspirational safety leader. Apply for the 2018 WorkSafe Safe Employer and Safe Worker Awards. Deadline: October 31, 2017 iszero ‘‘ ‘‘ your mission? Our front line people live, eat and breathe safety every day. That’s really what’s driving it forward. With a safety system, you never want to stand still. You always want to be growing and getting better. 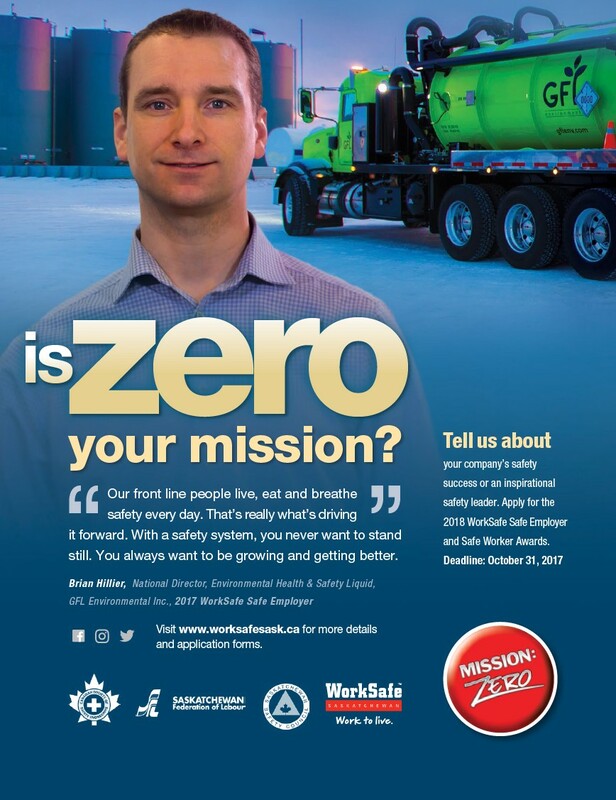 Brian Hillier, National Director, Environmental Health & Safety Liquid, GFL Environmental Inc., 2017 WorkSafe Safe Employer Visit www.worksafesask.ca for more details and application forms.